Students in the government’s Information and Communication Technology (ICT) program cheer on each other during the recent awards ceremony. The 123 students sacrificed six weeks of their summer break to participate and will do so over the next two summers as well. 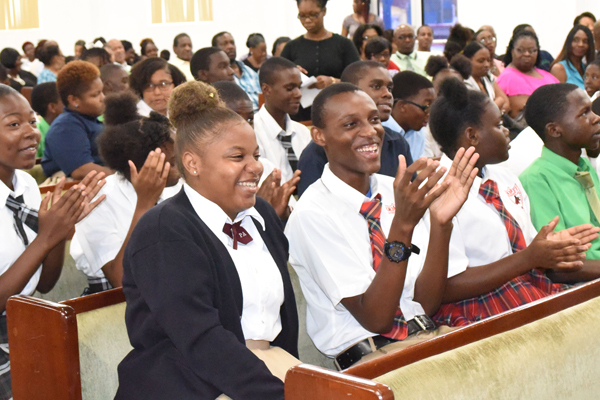 One hundred and twenty three students from private and public schools in New Providence were recently awarded certificates after completing phase one of the government’s Information and Communication Technology (ICT) program that will span across three summers. The three-summer ICT program is the brainchild of Prime Minister, the Honourable Dr. Hubert Minnis. There were 175 students combined between the program in New Providence and Grand Bahama. The students who were heading into 10th grade, were given the opportunity to gain hands-on training, college credits and international certifications at The Bahamas Technical and Vocational Institute (BTVI). The program is headed by Chair of Information Technology at BTVI, Anthony Ramtulla, who believes the seed has been planted for participants to become the leading experts in Software Engineering, Network Engineering and Information Technology Management in the nation. BTVI’s chairman, Kevin Basden, thanked the government for creating the innovative environment at no cost to the students. He spoke to the global reach of technology and how they have been given skills to create opportunities for themselves. “Information Technology (IT) is so broad; it touches every industry, every profession. At the end of the day, we need to hone the talent. While we are preparing you for the future, we are preparing you for the now. Don’t restrict yourselves just to this program. There’s a lot to learn on your own. And the workplace might be at home, but it doesn’t stop you for working for international clients,” said Mr. Basden. Associate Vice President of Academic Affairs, Leroy Sumner underscored IT’s importance globally. “As the government wants to make Grand Bahama a tech hub, the only way we can make that happen is we must start training early so there is less reason to bring in so many expats. IT is one of the fastest growing sectors worldwide. The skills are required by everyone. It is absolutely necessary as part of the workforce and you are filling a skills gap,” said Mr. Sumner. Llanzita Chea of Queen’s College receives her certificate of completion for the first phase of the government’s three-year Information and Communication Technology (ICT) program facilitated by The Bahamas Technical and Vocational Institute (BTVI). 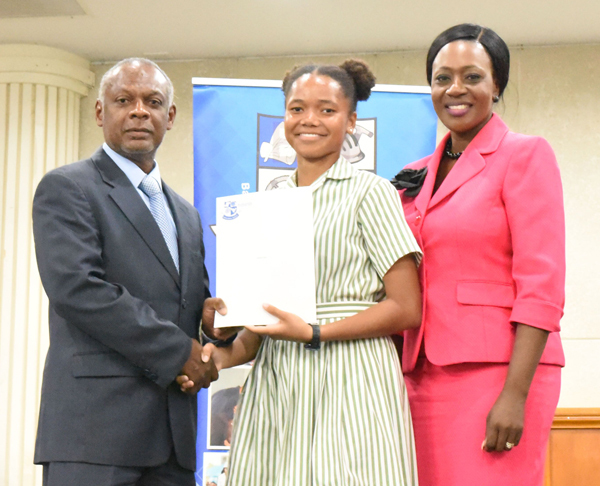 She was among the 123 students from public and private schools among the cohort in New Providence. Shown from left to right are BTVI’s Chairman, Kevin Basden, Llanzita and BTVI’s Dean of Academic Affairs, Pleshette McPhee. During the six-week, 300-hour training this summer, students were immersed in the Computer Information System Company (CISCO) networking academy, where they received an introduction to cyber security and the Internet of Everything (IoT). The students were also part of the Computing Technology Industry Association (CompTIA) Academy, receiving training for IT Fundamentals certification. CompTIA is considered the world’s standard for technology training. “I must say that for the most part I am happy with the attitude and performance of our students. They had to make the sacrifice to invest their time. They were supported by some awesome instructors; these fine men and women sacrificed their summer vacations to participate in this exercise,” said Mr. Ramtulla. Phase two of the program includes students participating in a blended course this fall and one in spring 2019. These in-between summer segments will mainly be conducted online with students attending face-to-face sessions with instructors every Friday or Saturday. 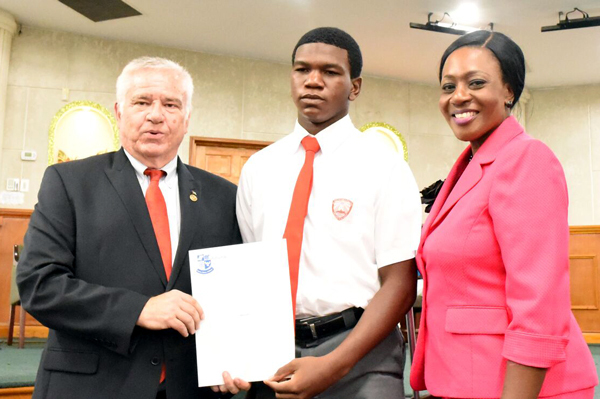 Dylan Curtis, a student of St. Augustine’s College, receives his certificate after completing phase one of the government’s six-week Information and Communication Technology program, facilitated by The Bahamas Technical and Vocational Institute (BTVI). Shown from left to right are BTVI’s President, Dr. Robert W. Robertson, Dylan and BTVI’s Academic Dean, Pleshette McPhee. BTVI’s President, Dr. Robert W. Robertson, noted that the quality of this pilot program has impressed others internationally. “We have had about five different schools between Canada and the United States expressing interest in this program of which the Board is actively supportive. The future of The Bahamas is in good hands. We have that kind of talent the world is looking for. It is right here,” emphasized Dr. Robertson. One student, SaMyah Taylor, admitted that initially she wondered if the program was for her. That perspective has since changed. “I cannot overemphasize the significance of these computer skills, whether in the field of work or in an institution of higher learning. There is also much satisfaction for me, from just being able to sit and devise my own website,” said the 10th grader of Nassau Christian Academy. “I was able to attain knowledge in different aspects of computer. Those include website making, assembling and reassembling computer parts, protecting information from hackers and writing an impressive resume,” she added. “They helped calm my fears and made this experience a life-changing one through interactive, relatable and simple methods,” said SaMyah.